The Mayor of Derry City and Strabane District Council Cllr John Boyle and An Cathairleach Seamus Ó’Domhnaill of Donegal County Council, along with senior representatives from Derry City and Strabane District Council and Donegal County Council, and a number of companies from the North West returned this week from a very successful trade delegation visit to Philadelphia. 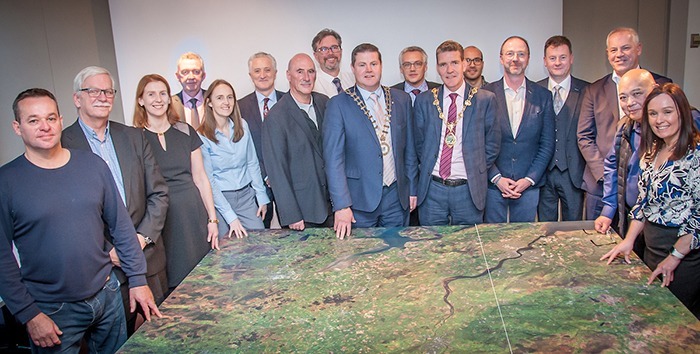 Mayor of Derry City and Strabane District Council, Cllr John Boyle said this is the second visit by the North West group to the city of Philadelphia and was organised to build on the initial good work that was done during a visit to the city last year. He said the Philadelphia market was a significant one for companies in the North West to tap into and it was important the Derry/Strabane and Donegal Councils were working in close collaboration to promote the North West City region to further develop links and relationships previously established between the two cities and regions. The Philadelphia trip coincided with a tourism and business visit to New York the same week by the Derry and Strabane Mayor and a number of Council officials to attend the start of the Legenderry Finale leg of the Clipper Round the World Race before its departs for Derry to take part in the Foyle Maritime Festival taking place in July and to officially launch the city’s International Halloween festival to the US audiences. Mayor Boyle said the visit was hugely worthwhile and a great opportunity for Councils to work closely with its strategic partners and local businesses to further develop ties with the US in particularly with businesses in Philadelphia and New York. “I was delighted to be part of the delegation that travelled to the US to continue with the excellent work that is being done on the ground to develop business links, put job creation and investment to the fore and promote our unique tourism and cultural offering to a new and captive audience. It was a very busy visit but very worthwhile for everyone involved. There is really strong Derry/Strabane and Donegal connections in Philadelphia and we have a lot in common in terms of industry and our links to the Port so working with them to further develop those business links is hugely important,” he said. Among the companies who travelled to Philadelphia were local agricultural company, Agri Fleming and data company Atlantic Hub from Derry. During the Philadelphia trip, the North West region delegation met Mayor Jim Kenney, Councilman Bobby Heenan and Congressman Brendan Boyle, and attended a number of functions and events including a Diaspora engagement event and a trade mission event. The group met with the Director of the NI Bureau Norman Houston OBE and the Deputy Irish Consul General Anne McGilicuddy as well as representatives from the economic development units in neighbouring areas of Chester and Montgomery. The delegation also attended a breakfast event at the Irish Immigration Centre of Greater Philadelphia. In New York, in addition to attending the Clipper Connect Business Series event, the Derry and Strabane delegation met with the British and Deputy Irish Consul General and took part in a City Region of Opportunities event that was attended by business investors and tourism culture, diaspora to showcase the region and up and coming events including the Foyle Maritime Festival and the International Halloween festival. Fleming Agri Products is a fifth generation family business manufacturing a range of agricultural and grounds-care machinery at their factory in Newbuildings. With almost 90% of production exported outside Northern Ireland, the company see a solid future in the viability of engineering and manufacturing in the North West region. Denmark, Latvia, Spain, Slovakia, UAE, Australia, New Zealand, and most recently the USA and Russia. due to increased demand from both the domestic and export markets for Fleming products, the workforce has had to be increased to create a third shift. This has created 10 further new job roles initially with further growth in employment as this new shift develops and increases the production output. designed and developed in recent years to come online. Currently Fleming’s employ 110 staff and the proposed new expansion will create a further 25 new positions at their base in Newbuildings. A US spirits company in Missouri has acquired a stake in a Londonderry liqueur firm as they look to build a distillery in the city. Derry. Ciaran Mulgrew, managing director of Niche Drinks, said: “Luxco has impressive distillery experience, having built Lux Row Distillers and partnered with Limestone Branch Distillery, both in Kentucky, and is nearing completion of a Tequila distillery in Arandas, Mexico. Ulster University Business School has been accepted into the prestigious Babson Collaborative for Entrepreneurship Education. Combined with its affiliation to Harvard Business School, Ulster University Business School has become the first Business School in the UK to have formal relationships with both institutions. Based in Massachusetts, USA, Babson Collaborative is a membership organisation that brings together educational institutions seeking to increase their capability and capacity in building entrepreneurship education programmes. It is an initiative by Babson College which is regarded as a global authority in entrepreneurship education. Through membership in the Babson Collaboration, Ulster University Business School aims to enhance its entrepreneurship education offerings by developing new flexibly delivered modules such as Digital Transformation, Artificial Intelligence and Entrepreneurial Growth, tailored to the needs of Northern Ireland’s business community and learning from the best practices of the most revered entrepreneurship educators globally. In April 2013, Ulster University Business School became the first School in the UK and is still the only School to be affiliated with Harvard Business School. Since then it has delivered the Microeconomics of Competitiveness course developed by Harvard Professor Michael E Porter, a world leading authority in matters of economic competitiveness. 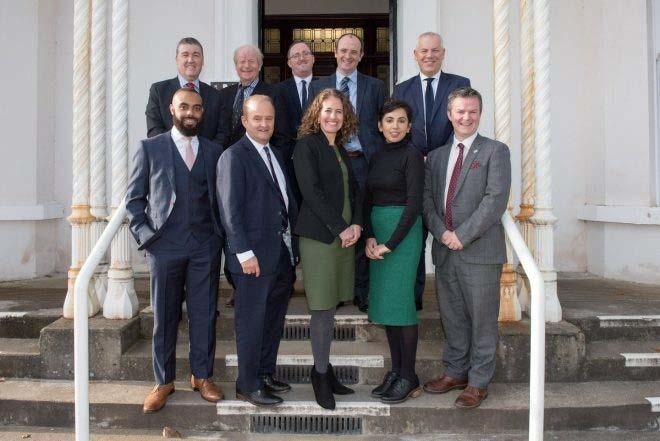 A first ever North West Trade delegation trip to Philadelphia next summer is one of a number of positive outcomes from last week’s joint Council led trade and investment mission in North East America. The delegation, led by Mayor of Derry City and Strabane District Council, Councillor Maolíosa McHugh and Leas Cathoirleach of Donegal County Council, Councillor Noel Jordan, included representatives from 15 local companies, Údaras Na Gaeltachta and senior council officers. Representatives from Ulster University, North West Regional College and Letterkenny IT also made the trip as the region presented a united front to showcase its offering for inward investment and potential export opportunity. A key element of the trip was showcasing the region’s entrepreneurship and innovation and to provide local companies with an opportunity to tie into the US market. The delegation returned to Ireland at the weekend and work has already begun on building on the strong connections made during their week in the US. 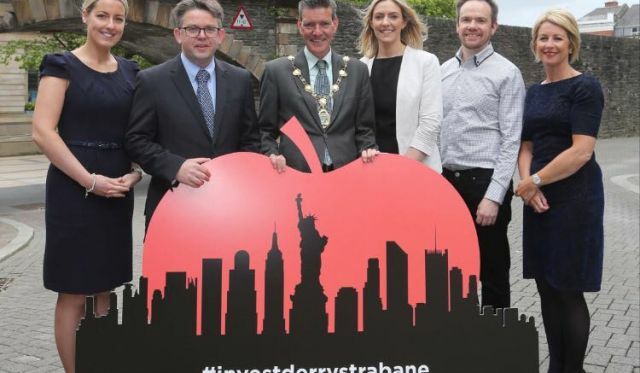 “The mission sought to build on the ongoing positive work being carried out by the two Councils to establish strong economic development links and initiatives in the US,” explained Chief Executive of Derry City and Strabane District Council John Kelpie. “We showcased the region as a well placed, cost competitive investment hub with high speed broadband and a young, talented and well educated workforce. The delegation began their five day trip in Philadelphia where they met with the City’s Mayor Jim Kenney and representatives from the City’s Chamber of Commerce and civic representatives to plan the details on the 2018 trade mission. After a day exploring business and life science partnerships in the City of Worcester and an evening meeting with Irish Consul-General Fionnuala Quinlan on Tuesday, the delegation met up with the 15 local companies for the start of three days of networking in Boston. On Wednesday morning, the Ireland North West Showcase presentation at allowed both Councils to sell the region as a prime area for investment before a networking event allowed the local companies to meet with potential partners in the US. Thursday saw the delegation take part in an Invest NI breakfast with Ireland’s Ambassador to the US Daniel Mulhall and key decision makers before a meeting with the City of Boston International Economic Development Office and a visit to Boston’s House of Representatives. The week climaxed with the annual Golden Bridges Conference and Awards on Friday at the Seaport Hotel and World Trade Centre where officers from Ulster University, Letterkenny IT and the North West Regional College joined representatives from Harvard in a panel discussion on the benefits of a strategic alliance between the three further and higher education providers in the region and the increasing partnerships with Boston-based colleges. Delegates heard from Derry City and Strabane District Council Chief Executive John Kelpie and Donegal County Council Chief Executive Seamus Neely who discussed Ireland’s role as America’s Best Friend in Europe. Officers from both Councils also discussed ‘Driving Tourism to the North West through World Class Events’ and ‘Helping Start-ups Survive and Thrive’. Reflecting on the trip, Mayor of Derry City and Strabane District Council, Councillor Maolíosa McHugh, said the joined up approach of the region’s civic, business and educational representatives filled him with optimism for the future. “The message from the Ireland North West delegation was very clear, that we were a prime location for inward investment and trade with Derry as a city operating in partnership with the regional towns of Strabane and Letterkenny,” he noted. 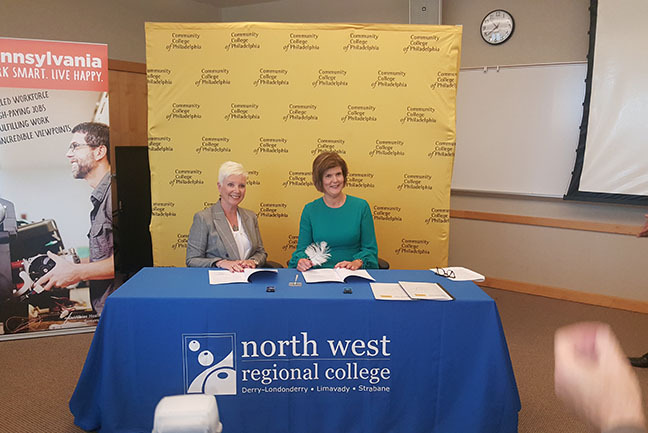 “The trip highlighted the importance of the joined up strategy of our educational institutions with the North West Regional College’s campuses in Strabane and Derry working alongside their colleagues in Ulster University and the Letterkenny Institute of Technology. Among the companies from the Derry City and Strabane District Council area in the Ireland North West delegation are AE Global (formerly Allpipe Engineering); The Clinical Translational Research and Innovation Centre (C-TRIC); ActionSense Ltd; Makematic; NeuroConcise; O’Neill’s Irish International Sports Co Ltd; Troll Inc; and Type 40 Creative. While Aniar Cumhacht Teoranta; Algaran Teoranta; O’Donnell’s Bakery; Silver Birch Gallery; Meastoiri Domhanda Teo; Eilis Galbraith and DS Environmental Services Ltd from the Donegal County Council area also took part. Civic leaders from the City of Boston and the North West of Ireland have signed an MOU this week to formalise their economic partnership. The ‘Boston-Ireland North West Innovation Economic Partnership’ pledges to further develop and expand the existing bilateral relationship between the two regions to create business and job opportunities through joint initiatives in innovation and trade. The Transatlantic partnership was signed during this week’s visit of a local trade delegation to the Massachusetts city led by the Derry / Strabane and Donegal Councils. Earlier this week, the Ireland North West delegation, that includes Council CEOs John Kelpie and Seamus Neely and Council officials, visited Philadelphia where a working group agreed to a first ever trade mission from Derry/Strabane and Donegal visiting the city this summer. The Mayor of Philadelphia, Jim Kenney, also met the delegation who spent a full day in Pennsylvania’s largest city exploring opportunities for business and educational partnerships. The MOU agreement with Boston will initially focus on the fields of entrepreneurship, life sciences and healthcare technology and aims to build upon the successful economic development missions to Boston in recent years. “I would like to warmly welcome the signing of this Memorandum of Understanding between our two regions,” said Mayor of Derry City and Strabane District Council at this week’s signing in Central Boston. “I look forward to seeing the development and implementation of our joint and coordinated initiatives, initially in the areas of Entrepreneurship, Life Sciences and Healthcare Technology. “This is a hugely positive development that builds on the strong work that has gone on behind the scenes in recent years to strengthen the economic partnership between our regions. Among the responsibilities of both regions detailed in the memorandum are the sharing of best economic practices to strengthen their mutual abilities to support bilateral trade. The parties have also agreed to encourage academic research and development collaboration in life sciences and healthcare technology, as well committing to the promotion of economic development and opportunities for small businesses.